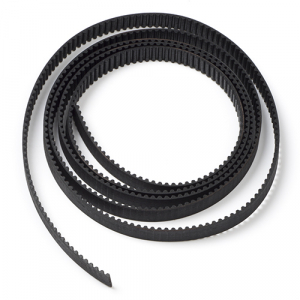 The ultimate in strength, Reprapworld's steel-reinforced timing belts are the premium option for eliminating play and backlash in high-precision 3D printing and CNC machines. The polyurethane body is abrasive resistant under high loads while still allowing excellent flexibility and tooth meshing. The internal steel reinforcement cables provide unparalleled tensile strength, but due to steel's lower ductility, this belt should be used with larger radius (24+ tooth) GT2 pulleys and toothed idlers.